When Google Chrome launched, many people complained that the browser didn't detect feeds. Apparently, this feature has been implemented in an extension that will come preinstalled in Google Chrome. The extension "adds a button to the URL bar when a page has a feed that can be subscribed to". 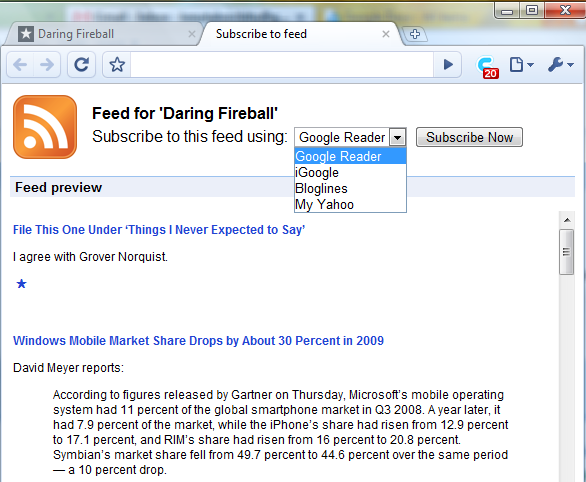 When you click on the orange button, the extension previews the feed and it lets you subscribe using a feed reader. The support for extensions is only available in Chrome's dev channel. Google will soon launch an extension directory at https://chrome.google.com/extensions and the first beta version that supports extensions will be released in early December. This is the same RSS extension that has been available at http://dev.chromium.org/developers/design-documents/extensions/samples since extensions have been implemented. and not how happen with Theme gallery that only Google Inc.
Where's the reference stating that this extension will be installed by default? If this happens as you say, though, I'll be a happy man indeed. Meh. I like this one better: http://bit.ly/5FrKp. It does the same thing, except it skips the cruft and goes straight to Google Reader. Plus the icon is more colorful, and looks similar to the GReader logo. What is that twitterish C in the second screenshot? Aaah sweet, they ripped it right from Opera! Ok thanks for the information Mr. Chitu! I think GOOGLE is the Best !! Buy stock it will be worth it ! Good Bye Gates Thanks for having ya .. Hello Google Wi-Fi the future Telephone device ! !Its been too Long ... Cell phones have got just too expensive.. I really would like WiFi / Satellite get rid of cell towers and Cell Fortunes ..Go get them Chrome OS!! Due to mouse cursor pointer is not moving [It is freeze'] I cannot shut down PC . I have to switch off power supply and reset PC again.